Allow our chefs to prepare made-to-order crepes for your special occasion. Your guests will love the sight, the aroma and best of all, the taste of our crepes as they enjoy watching our chefs prepare their very own personal creation. New Orleans flavor, now a Memphis classic! Choose from the following menu or our ask Chefs to build your very own "dream" crepe. The Mempho: Marinated Chicken breast, artichoke hearts, portabella mushrooms, baby leaf spinach and melted mozzarella cheese. New Bridge-Old Bridge: Marinated chicken breast, mozzarella cheese, baby leaf spinach, our special apricot/pineapple spread and honey drizzle. The Mid-Towner: Fresh Baby leaf spinach, melted mozzarella cheese, portabella mushrooms and our special tomato/pesto blend. Zippin Pippin: Chicken breast, mozzarella cheese, baby leaf spinach, marinated tomatoes and honey mustard. Rufus Thomas: Marinated chicken breast, melted mozzarell cheese, fresh tomatoes, baby leaf spinach topped with raspberry preserves and walnuts. The Bluffs: Freshly sliced bananas, sliced strawberries covered with nutella chocolaty spread and whipped cream. The Elvis Presley: Freshly sliced bananas over a smooth bed of peanut butter and drizzled in honey. Just the way the King would have liked it! No occasion too large, we can cater your event for up to 1000 guests. Ask about including our Cappuccino Bar with your Crepe Station. 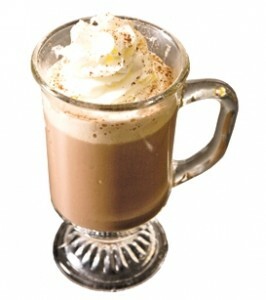 Let our barista prepare a Delicious Mocha Cappuccino at your event.